Popeye ate his spinach. The Doctah ate his spirulina. The color of money. The color of trees. The color of magic. Well, yeah, I don’t know about the magic part, but let The Doctah edumacate ya. 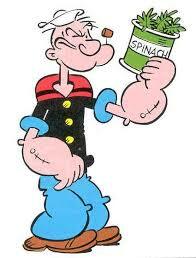 In 1940, Popeye ate his spinach. It had amazing effects. Protein, yum. Big muscles, plenty of ladies. Olive oil, yes, Olive oil, stole his heart. Do you understand the lingo? The oil was the bread to his butter. (Yes he owned both). That’s was in the 1940s. Now, there are newer foods out there: spirulina and chlorella to be exact. So what are spirulina and chlorella? Well they are sea algae. Your next question should be, “Why the F*ck” would I eat sea algae? Well that’s simple, young jedi. Your body is made up of 90% water or 95% or some very high number like that. So that means stuff from water, especially from the sea, will have a beneficial effect on your body. The spirulina contains high quality protein as well as other high quality sources of variable nutrients for your body to consume. Nutrients = Good. Just in case you didn’t know. The chlorella contains chloryphyl. Chloryphyll is essential for plants to grow. People do not generally think of themselves as plants, BUT, i’ll give it to you simply: what does a plant do? It grows. What do people do? Generally they grow. Hmmm… molto interesante. Now go on Amazon, and grab some hawaiin pacifica spirulina and some 1000mg chlorella. If you got the cash, grab a 3 month supply. Come see the Doctah in 3 months, and I dare ya to tell the Doctah you don’t feel better. Disclaimer: The Doctah does not try to cure you, you cure you. He just shows you the way. Posted on March 21, 2014, in Average Blog Posts and tagged chlorella, doctor, eating, fitness, green, healthy, man, plants, popeye, sailor, spirulina, the, trees. Bookmark the permalink. 5 Comments. And why you ask is your body 90% H2O? Your skin is your largest organ 😉 MOISTURE! Ps. loved this! #Sciency-things! OMG…I just noticed this feature, right now. The orange Q box. And sorry about the advert stuff again, I thought it was cute though…hehe oops. Spinach is sooo good. So rich in iron, Fe. A bit salty. LOVE!